PROJECT NOT COMPLETE YET, We will update this review once project is complete. At the time of writing this review: Our permits were approved 185 days ago. Digging began 173 days ago. 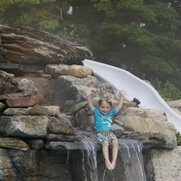 When we wrote our first check in July we had NO IDEA permits for our little plunge pool would take as long as they did. We broke ground in early October we hoped the mess would be done for Halloween. Weather was not on our side, so surely it would be done by Thanksgiving, nope...Christmas, nope.... Spring is here and we are optimistic that perhaps the concrete and fence will be done by April...we will keep you posted! This has been a learning experience for us. We will say that Walter (salesman) was very nice and professional. Deb (Office manager) is very quick to reply and a straight shooter (which we appreciate:)) Electrician they hired was EXCELLENT. Excavator they hired used a big machine (not the small one like we discussed) and made a big mess in a very visible spot. Concrete contractor and fence contractor they brought in seem reputable but they have not performed work yet so the jury is still out. Gabe (owner) has made himself VERY available to us and we are confident that he is building us a great pool and we look forward to seeing water in it very soon! I been doing business with Contemporary Pools & Spas since 2010. The install and construction was professionally accomplished. To this day I've been using there services where Gabe, Debbie & crew go over and beyond for my up keep and maintenance of all aspects for my family's comfort and swimming needs. Being anxious at times Contemporary is always there. 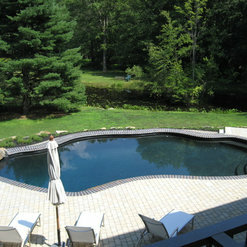 Rob, Contracted with Contemporary Pools & Spas to construct a pool in his yard. Prior to Rob Signing a contract we went over all the cost that can and would be incurred. These Items where also spelled out in his written estimate and contract. Prior to any additional charges or work performed Rob was notified and agreed in writing, Rob signed written agreements (change orders). After agreeing to, signing change orders and work performed Rob felt he should be entitled to have work performed for free. Rob, supplied his own lights, pump and salt system. Therefore it was not our responsibility to supply salt for the pool. As per Rob’s contract we did supply and put start up chemicals in his pool. The day of the backfill, Rob asked the excavator to put spoils in certain areas. 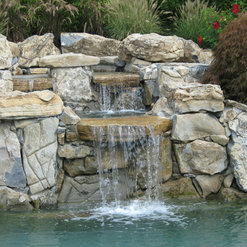 Rob is a Landscape contractor, he was going to do his own planting and waterfall. After we had left the property and weeks later he wanted us to return and regrade the spoils of the dig. We explained spoils where placed at his request and he could contact the excavator directly if wanted additional work done. He felt it was Contemporary Pools & Spas responsibility after following his directions. Rob contracted with Contemporary Pools & Spas to install a patio of 1 color stamped concrete, after our mason meet with Rob he wanted to increase the patio by more than double. We sent Rob an estimate based on his requested square footage and price per square foot originally quoted. During the construction of Robs pool he had no complaints, until he asked us to return and regrade his yard at our expense. Contemporary Pools & Spas professionals have been installing our vinyl pool liners and safety covers for the past few years. They have a wonderful and personable staff who all make dealing with their business a pleasant experience. They have created elegant and unique pools, while always paying attention to detail. 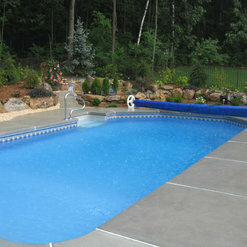 This commitment to each pool ensures that their vinyl liners will be installed properly and fit well every time. Contemporary is also dedicated to making sure each pool they build is safe for the off-season by installing our custom safety covers. They make sure that they put the safety cover on your pool the proper way so it can exceed the highest safety standards for the winter. 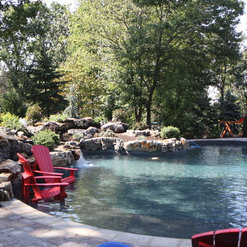 After interviewing 6 different pool companies in 2009 we selected Contemporary Pools to build our new in ground Gunite free form pool in 2010. The owner of the company, Gabriel Ricciardi Jr. (Gabe), was involved & supervised every step of the project beginning with the quotation straight through to turning on the hose to start filling the pool. He was personally on site, all day, every day for every aspect of the pool construction. Did every thing go down without a hitch? NO, of course not, it never does with any type of construction. The key to a good contractor is how the problems are dealt with and Gabe could write the book on customer relations in making the problems turn from lemons to lemonade! For example, because of my towns building/zoning codes the size, location and foot print of the pool was severely restricted to a certain area within my yard. Part of the problem was my electric service feed came from the poll diagonally across to the corner of the house. All electric lines had to be a minimum of 22.5 feet from the nearest surface of the water. Gabe's solution was to have JCP&L bury the service line in the ground through conduit and the electrician moved the service panel from the back of the house to the side. This allowed us to get within 5 feet of the line (by code) and gave us much more flexibility to location and size (which we increased from 424 sq ft to 640 sq ft!). This obstacle was resolved in the planning stage, however, there were two situations that really demonstrated I had picked the right person in choosing Gabe. The first, while driving the mini Cat (small back hoe) through an access area that only had a foot of clearance, Gabe (yes, Gabe actually does jump in and operated equipment when needed) accidentally bumped the air conditioner with the load on the Cat. There was obvious damage to the copper tubing. Gabe immediately had us call the AC service company, paid for the diagnostics and deducted the cost of repairing the unit from the pool job. My grandmother would have called him a 'mensch' (a person of integrity and honor). The second was truly remedying an emergency that could have been a catastrophe. The shape of the pool is roughly an elongated, slightly curvy Mickey Mouse head. The plan was to have the pool steps on the side of the pool closer to the house, sort of the left ear. The rough 'dig' took the better part of a day and was finished in the late afternoon. All seemed well and the crew was just stowing their gear when we noticed a stream of water entering the pool about 2 feet down through the side wall on the shallow end, the right ear, opposite where the stairs were planned. We hadn't noticed anything earlier but someone had flushed the toilet in the upstairs bathroom (same side of the house as the pool) and it was now draining into the pool (luckily it was only urine diluted by a couple gallons of water!!). Apparently the big excavating back hoe had sheared the waste line on that side of the house in digging the pool. The sheared pipe was, first, black, and second, partially filled with dirt from the dig and all but invisible until the water started flowing! Gabe to the rescue - he immediately sized up the situation, sent some of his crew to Home Depot to pick up pipe and connectors, and had the others prep the area by clearing away dirt to access both sides of the now broken pipe. In Gabe's defense, the pipe was not indicated on the property survey, and the plans were approved by the township who reviewed the exact placement with regard to such things as electric and sewer service as well as property lines. To continue, within 1-1/2 hours the pipe was repaired and fully functioning although spanning an open space across that rounded corner of the pool. Again, Gabe's ability to adjust and be flexible on the fly allowed him to come up with a genius solution - move the steps from the left ear to the right and encase the spanning pipe in the concrete steps!! This not only worked out perfectly it also turned out to be a blessing in disguise allowing an area to hang out (yes, the steps are a hang out!!) without clogging access into/out of the house. 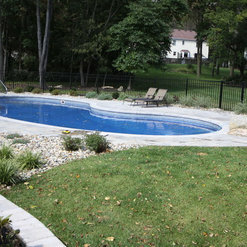 Contemporary Pools additionally provided the following services not already mentioned including, but not limited to: installing over 1500 sq ft of paving blocks; installing a roof mounted solar heating system; installing 2 gas lines for BBQ's; fencing the entire property; building a below grade cinder block 'liberty retaining wall' for a new pool shed to bring access level to the pool deck paving; trenching out a 40'L x 5'W x 3'D bed and installing a 3' deep continuos barrier for planting dwarf bamboo; hand laying a 40' (+) fieldstone walkway; building a 30'W x 10'D earth berm for landscape plantings; and building a 20'W x 5'H freeform waterfall, and installing buried pvc piping for remote water access for my garden and waterfall/bamboo area to name but a few. Oh, and did I mention, Gabe had injured his foot at some point over the winter before the dig of summer of 2010 and was in a 'boot' hobbling around, down in the trenches, up on the mounds, over rebar and through the mud without missing a beat the entire summer! I have already recommended Contemporary Pools in the past and would unhesitatingly do so in the future. Also, just a note regarding the project cost below included not only all of the above but additional items such as township fees, cartage, special plaster finishing, custom freeform permeable Merlin cover, Dolphin automatic robot cleaner, awnings, various extras and other landscape provisions. 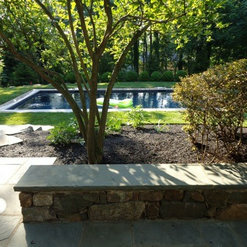 Contemporary Pools & Spas did an excellent job designing and constructing our new pool in Montclair. The quality was top notch and the pool looks very high end. They did it at a price as good or better than the other quotes that I received but completed the project much faster than what the other companies that I spoke with promised. 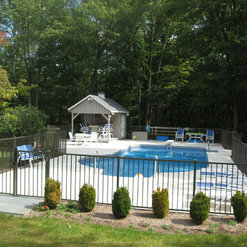 The pool and patio were 100% done, from start to finish in 2.5 months including a beautiful patio. Gabe and Debbie were also good about answering all of my questions and concerns. I've let Gabe know that he can bring potential clients by to look at our pool to see the quality of the job. 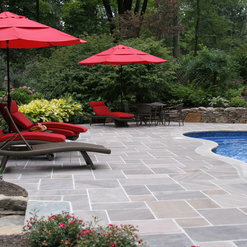 Want the pool of your dreams, Call Contemporary Pools & Spas. We admired a friend's pool. He recommended CP&S. Our property is an unique shape. 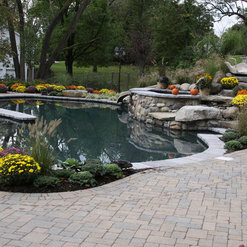 We wanted the largest pool we could fit but still maintain the natural landscaping. The installation was quick & efficient. Gabe met all of our specifications & more. Our friend's pool is spectacular but so is our pool. They do not resemble each other but both are amazing. Gabe took the time to understand our needs & designed it beautifully. We continue our relationship with Gabe & Debbie. They service & maintain our pool. They are always available for questions at all times. We highly recommend them. AAA++++ Excellent contractor. You can count on them to do what they promise. My experience has been that you are a Contemporary pool customer for life and you are treated like family. The owner and employees are genuine and truly care about customer satisfaction even years after the construction is completed. You can trust this company and that is not true about all pool companies. The owner is a man of his word and knows his business, and this to me, this is huge when deciding on any contractor. I do not hesitate to recommend them. Frank R.